GEORGE Osborne revised the UK’s growth forecast downwards and pushed back the date when he predicted public finances would reach surplus when he announced his Budget yesterday. 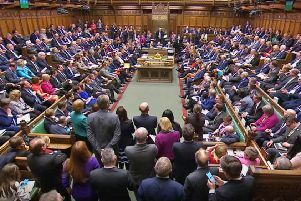 Underlining the government’s commitment to bring down the deficit, the Chancellor conceded that a surplus would not be reached until 2019-20 – a year later than was predicted in the coalition’s March Budget before the general election. Delivering his first Conservative-only Budget, Mr Osborne announced a fiscal plan that would see a £37 billion austerity squeeze over the current parliament, including £12bn from welfare. But he said no year will see cuts as deep as those in 2011-12 and 2012-13. He added that the government would be able to avoid expectations of a “rollercoaster” in public sector spending which would have seen austerity sharpening before the squeeze eased off. This was due to better-than-expected tax receipts, higher savings and the sell-off of stakes in taxpayer-backed banks. The Chancellor maintained that the economy was “fundamentally stronger than it was five years ago” when he first came to office as part of the ­coalition with the Liberal ­Democrats. But he unveiled latest independent forecasts from the ­Office for Budget Responsibility (OBR), predicting that gross ­domestic product (GDP) will grow by 2.4 per cent this year, down from a previous prediction of 2.5 per cent. GDP growth for next year is forecast at an unchanged 2.3 per cent while for 2017 it is expected to be 2.4 per cent, up from 2.3 per cent, according to the OBR. This level of “strong, steady growth” was predicted for the rest of the decade, the Chancellor added. Meanwhile, latest forecasts for government borrowing for 2015-16 suggest it will be £69.5bn, down from a prediction in March of £75.3bn. But in 2016-17, it is now forecast to be £43.1bn, up from £39.4bn, while it is also predicted to be higher in 2017-18, at £24.3bn, which is up from £12.8bn. In 2018-19, the OBR forecasts borrowing of £6.4bn, compared with a prediction in March that the Treasury would be in surplus by £5.2bn. Instead, the surplus has been deferred to the following year, when it is expected to be £10bn, higher than the £7bn previously pencilled in. For 2020-21, the surplus is expected to be £11.6bn. Responding to Mr Osborne’s budget, interim Labour leader Harriet Harman admitted Labour would have made spending cuts to areas that are not protected and would have taken action to reduce the welfare bill. But she highlighted the “still fragile” recovery, with economic growth forecast to be lower than expected this year. Ms Harman said: “More than seven years after the financial crisis, five of which were under this Tory Chancellor, the country is still dealing with the consequences and the recovery is still fragile. “Today’s Budget document shows that growth has been revised down this year. “Of course there need to be tough decisions to get the deficit down. Ms Harman pledged to make the party a “different kind of opposition” that would support sensible policies but “fiercely oppose” those that hit working people. She said: “When you’re in ­opposition the temptation is to oppose everything the government does, and believe me I feel that temptation. CHANGES to the tax regime for buy-to-let mortgages have been branded “shocking” by industry leaders, with the move likely to lead to higher private rents. In his Budget, the Chancellor cut mortgage interest relief on buy-to-let homes in an effort to create a “level playing field” between prospective landlords and those buying a property to live in. Wealthier landlords receive tax relief at 40 per cent and 45 per cent – but this tax relief will be restricted to the basic rate of 20 per cent by April 2020. John Blackwood, chief executive of the Scottish Association of Landlords, said: “This is a shocking decision by the Chancellor which unfairly discriminates against landlords who provide valuable housing across Scotland. “Although we welcome other measures in the Budget such as reforms to the rent-a-room scheme, which will increase supply of affordable rented ­accommodation, the decision on buy-to-let mortgages means landlords will essentially be taxed for investing in their ­businesses. Jane Guaschi, business manager at Direct Line for Business, said: “The reduction of mortgage tax relief for owners of buy-to-let properties will have a significant impact on the income ­generated by landlords across the country. Property-related shares, including Barratt Developments, Crest Nicholson, Foxtons and Persimmon, were hit on the London Stock Exchange. Laith Khalaf, senior analyst, Hargreaves Lansdown, said: “Housing stocks have seen a significant sell-off in the wake of the Budget, as the market weighs the cost of the abolition of mortgage interest relief on the buy-to-let market.